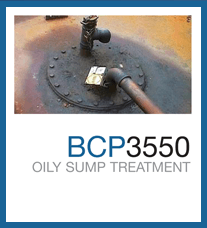 BCP3550 treats sumps containing hydrocarbons such as gasoline, diesel, oils and greases, antifreeze and petroleum solvents. Storage DO NOT FREEZE! Store in a cool dry location. Do not inhale dusts. Avoid excessive skin contact. See MSDSBCP3550 reduces the accumulation of petroleum products in sumps and drains. This reduces the cost of cleaning and maintenance, improves odour control and achieves BOD reduction. BCP3550 is supplied in water-soluble pouches for direct addition to drains and sumps. If there is no turbulence in the application area, pre-mix the product with five gallons of water and then apply. Adjust dosage rate based on results. Use in accordance with all Federal and State regulations. Results will depend upon site and climate conditions. The information presented in this Product Sheet is believed to be reliable. This information is provided as representative only and there are no warranties, expressed or implied, regarding its performance. Since neither distributor nor manufacturer has any control over handling, storage, use and application conditions, they are not responsible for any claims, liabilities, damages, costs or expenses of any kind arising out of or in any way connected with the handling, storage or use of the product described.